5" A/O Sanding Disc, 180 Grit H&L 8 Hole, 100 pk. Grizzly H9655 - 5" A/O Sanding Disc, 180 Grit H&L 8 Hole, 100 pk. Sharp, fast-cutting white aluminum oxide abrasive with superior finishing characteristics. This is a stearated product designed to reduce loading with a full phenolic resin bond system to improve grain adhesion. Backed with a strong yet pliable 0.003 film back to provide a truly uniform finish. Film backing out-performs paper by a wide margin and lasts up to three times as long! 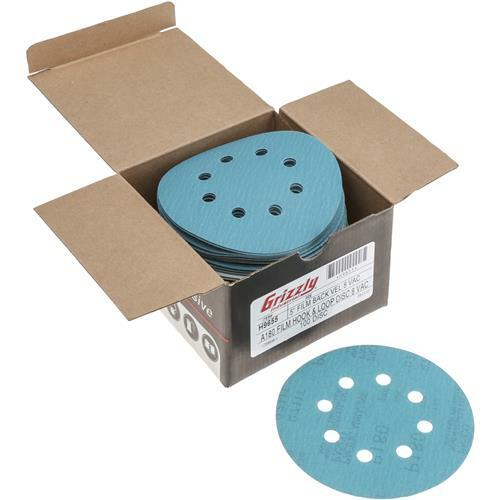 These 5" Sanding discs are 180 grit Hook and Loop with a 8 hole pattern for dust collection. Comes in a pack of 100.